Down home meals prepared with local ingredients and served in hip but homey settings are a Seattle specialty, so The Astronomer and I found ourselves eating plenty of American comfort food during our stay. 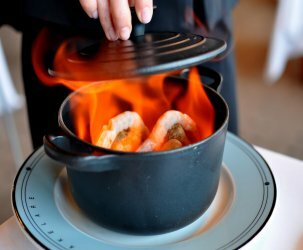 After such thoroughly satisfying meals at both Local 360 and Steelhead Diner, we did not hesitate to seek out another upscale diner experience. 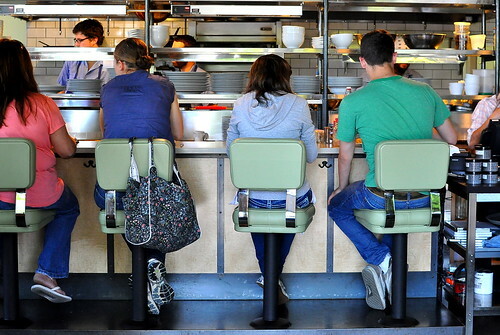 This time, we headed to Capitol Hill’s Skillet Diner for lunch. 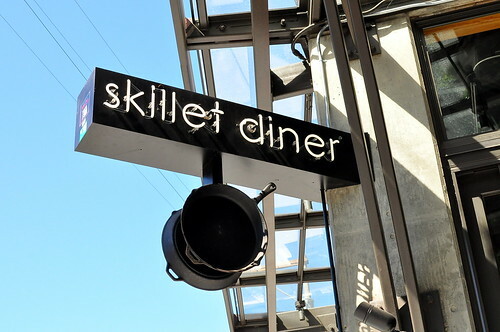 Skillet Diner began as a mobile food trailer called Skillet Street Food, which was launched by Chef Josh Henderson in 2007. The trailer garnered a passionate following throughout the Pacific Northwest serving American comfort food prepared with classic technique and seasonal ingredients. 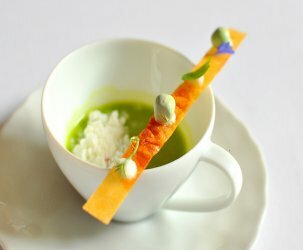 The brick and mortar restaurant, which opened in spring 2011, serves the same kind of easygoing fare that resonated with fans of the mobile establishment. The Astronomer and I grabbed two seats along the counter which peered into the restaurant’s open kitchen. 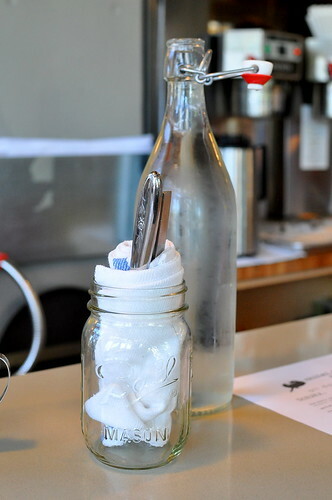 We worked up quite a sweat trekking from downtown to Capitol Hill, so we were pleased as pie to be greeted with a bottle of chilled water and ready mason jar glasses. To start, we shared a kale Caesar salad ($7) that the restaurant considerately split into two portions without us having to ask. 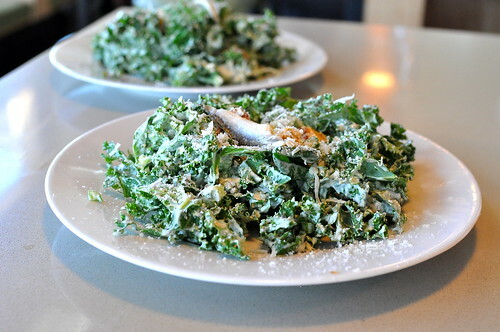 The mound of creamily dressed kale came topped with shiny boquerones (marinated white anchovies), buttery croutons, and Parmesan cheese. The kale’s hearty texture offered a nice change from traditional Romaine greens. Even though the warm Seattle weather dictated something light for lunch, I couldn’t resist ordering the totally over-the-top maple braised pork belly and cornmeal waffle with two sunny eggs ($13). 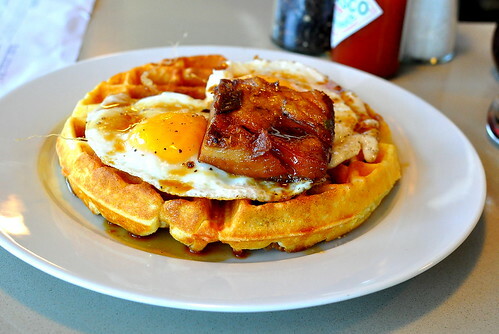 The crisp and savory waffle provided a sturdy base for the lusciously caramelized hunk of belly and fried eggs. 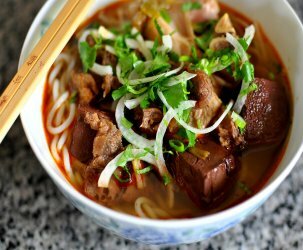 The pork’s sweet drippings sweetened the entire package just right. 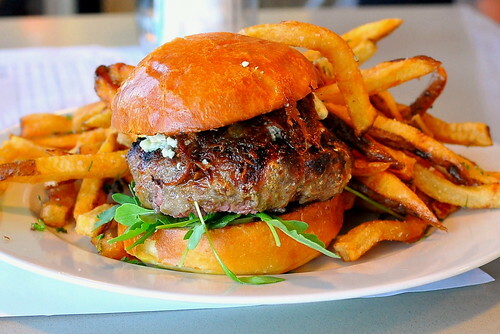 The Astronomer was feeling decadent as well and ordered “The Burger” ($14), which was made from locally raised Painted Hill beef and garnished with house-made bacon jam, arugula, and bleu cheese. 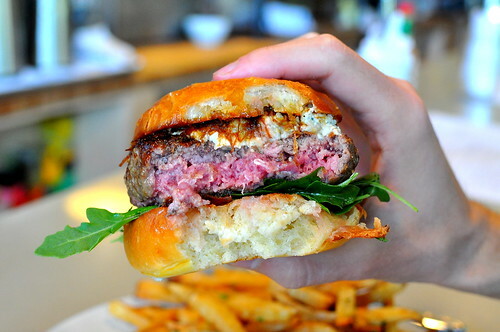 The grass-fed patty was moist and perfectly pink in the middle, just how The Astronomer likes it. The highlight was the sweet, smoky, and salty bacon jam made from rendered bacon simmered with spices and onions. Aw, yeah! We were much too stuffed to order dessert at Skillet, but managed to find some room when we stumbled upon High 5 Pie on the walk back to our downtown digs. How can anyone pass on an adorable pie shop with vintage flare? 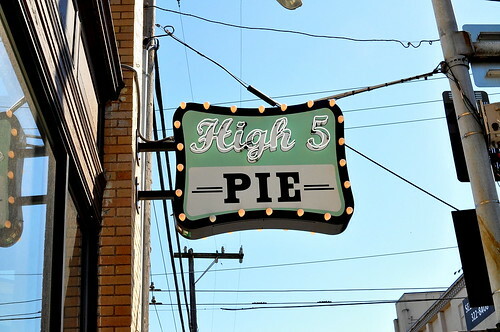 The woman behind High 5 Pie is Dani Cone, the founder of Fuel Coffee and an avid fan of pie. 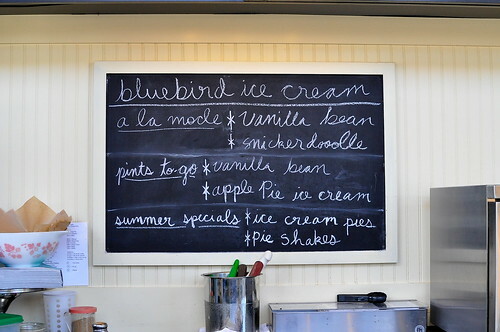 All of the sweet and savory pies here employ her Grandma Molly’s all-butter pie crust recipe. I couldn’t leave Seattle without trying its famed berries, so I ordered a slice of the marionberry pie that I requested warmed in the microwave. 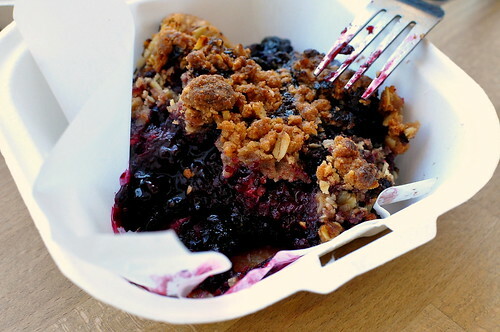 The filling was pleasantly tart, while the crumbly oat topping brought some sweetness. And as far as I could tell, Grandma Molly’s crust was a delight. Then again, it was all kind of a delicious mush. High-five for impromptu pie breaks! Dear lord, that’s … decadent. I must go and have burger and pie! Yum, I never thought of making a kale salad like that. Adding that to my list of things to do.